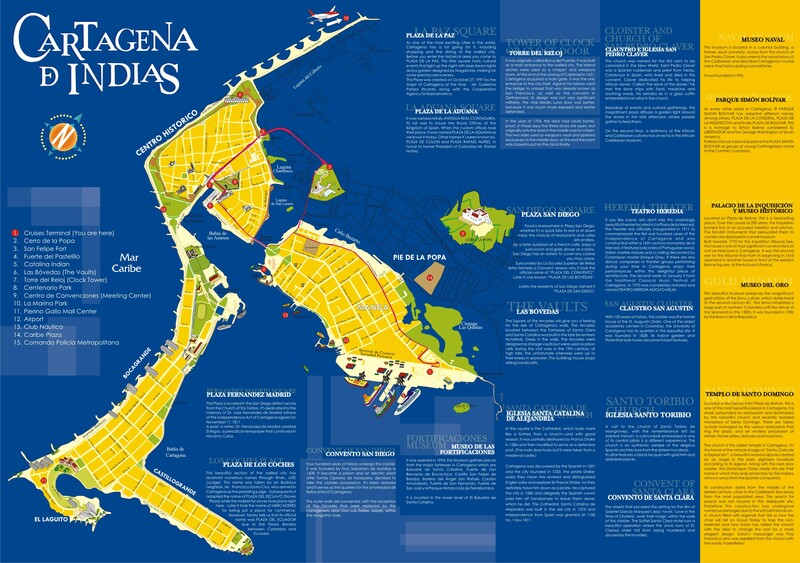 The Port of Cartagena de Indias is located about 4 km from the old city. It offers 6 docking sites in an industrial environment. The area around the port is not "inviting". At the Cruise Ship Terminal, visitors are received with typical music and landscaped gardens. They may visit the duty and tax free store, the cafeteria, Juan Valdez coffee store, or the shopping area. Here they can find handicrafts, emerald gem stones, jewelry, pre-Columbian items, souvenirs, leather goods, cigars and more. There is a free shuttle bus from the ship's pier to the cruise terminal where you can get taxis to the Old City. You can easily walk to all of the different sites in the Old City. From one end to the other is about 30 minutes but half the fun is all of the sites and people along the way. Inside the port the taxis are posted to cost $20 one way for 4 people. The normal fare outside is about $10 for a trip to Old Town. (10 minutes ride). Cartagena is a UNESCO World Heritage site. Considered by many as one of the world's most beautiful, fascinating and magical cities, Cartagena was founded by Spanish conquerors as a main port to bring Europeans and their goods into South America, and transport gold, silver and all sorts of plants, animals, minerals and handicrafts from all over the continent across the Caribbean and on to the Old World. Cartagena’s old city is its principal attraction, particularly the inner walled town consisting of the historical districts of El Centro and San Diego. It is a real gem of colonial architecture, packed with churches, monasteries, plazas, palaces and mansions with their overhanging balconies and shady patios. Today the city hosts intellectuals and plenty of beautiful restored homes among exotic, highly attractive and dynamic plazas, waterfronts and other public spaces. One of the most hospitable venues for any tourist looking for a good rest, the Caribbean and Colombian magical realism and tropical ambiance or natural wonders. The city hosts many conventions but the two of major interest to Europeans and Americans are without a doubt the classical Music Festival held in the first two weeks of January and the South American version of the (UK) Hay Literary Festival towards the end of January. Both are particularly imaginative with world class performers, writers, and critics. Hop on/off tours starts right at the cruise terminal and includes a walking tour. Maps with walking tours are available at the cruise terminal. Be sure to stop by the Santa Clara Hotel to see the terrific central courtyard. The former convent on the site has been converted into a wonderful place to stay. Wander the area and discover the charms of this delightful city. Taxis are generally easy to find, although in the old town you may have to walk a few blocks away from the center, toward the wider road close to the wall. About 10.00 USD per cab from the pier the clock tower entrance should do it. A horse-drawn carriage tour is about 60 USD for half hour tours, 200 USD for two hours. Crime levels in the major tourist areas of Centro Historico, Bocagrande, and Castilogrande are considered comparably lower but are continually areas of much petty theft and other similar crimes. Avoid public transportation. This archipelago, about 35km southwest of Cartagena, consists of 27 small coral islands, including some tiny islets only big enough for a single house. The archipelago is surrounded by coral reefs, where the color of the sea ranges from turquoise to purple. The whole area has been decreed a national park, the Parque Nacional Natural (PNN) Corales del Rosario y San Bernardo. Tours depart year round from the Muelle Turístico de la Bodeguita in Cartagena. Boats leave between 8am and 9am daily and return about 4pm to 6pm. The Colombian textile industry is well-recognized and reputable around South America and Europe. Clothing and lingerie are particularly regarded as high quality and very affordable. Cartagena has a wide range of shops selling crafts and souvenirs, and the quality of the goods is usually high. Most stores are open 7 days a week. The Bocagrande and El Laguito districts have good shops, and the city's largest shopping mall is the Centro Comercial Pierino Gallo. Las Bovedas is an old prison that is now an indoor market selling works of art and souvenirs. The water is drinkable right from the tap in most of the major cities, but be prepared to buy some bottles if you go to the countryside. Agua Manantial Bottled water is recommended, it comes from a natural spring near Bogotá. An advice: make sure you do not use ice cubes, or drink any beverage that might contain non-distilled water, ask if the beverage is made with tap or bottled/boiled water. The peso is the currency of the Republic of Colombia. 3065 Peso = 1 USD. The peso is highly volatile. The peso also uses the $ sign, so be careful. DO NOT, under any circumstances, exchange your dollars for Colombian pesos with anyone offering to do so on the streets of Cartagena. You will be robbed. WiFi is available at the cruise port terminal so you can bring your laptop or phone to access the internet. The cost is $3 an hour and tickets can be bought at the cash registers. The cyber cafes in Cartagena are centered in the Centro (Old Town) district, cheap but slow times. Reinado Nacional de Belleza (Nov) The national beauty pageant celebrates Cartagena’s independence day. Miss Colombia, the beauty queen, is elected on November 11, the high point of the event. The fiesta, which includes street dancing, music, and fancy-dress parades, strikes up several days before the pageant and the city goes wild. The event, also known as the Carnaval de Cartagena or Fiestas del 11 de Noviembre, is the city’s most important annual bash.